These aren't simply playing cards...they're a powerful survival tool for you and your loved ones to use if you need to survive a disaster situation. Our 1st printing SOLD OUT in 24 hours! The 2nd & 3rd printing SOLD OUT before we got the order. We're currently taking orders on the next printing of 2,000 and they're going FAST! 52 insider secrets help you not only survive, but thrive after disasters and breakdowns in civil order in urban areas, and much more. Their small size (poker size) and light weight (3 ounces) makes them portable so that you can have them with you all the time to use as flashcards to hardwire essential survival skills into your brain. They are inexpensive enough that you can put one in every GO bag, 72 hour kit, and glove compartment without breaking the bank. They're priced so that you can give them to family & friends as gifts... both to fellow "preppers" and to people that you want to test the waters with. Stress, low light, age, and exhaustion all make it harder to read small type. These cards strike a perfect balance between the amount of information on each card and having a large enough text to actually be readable, so you'll be able to read them when you need the information most. Pull this deck of cards out at your next poker night and see where the conversation goes! 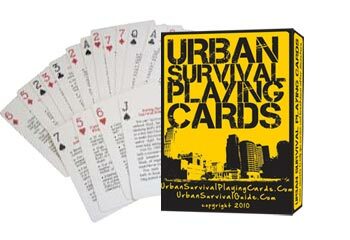 ￼Most importantly, if/when disaster strikes, you'll have your Urban Survival Playing Cards to refer to with many of the most important lessons form the SurviveInPlace.com Course. “Very nice deck of cards. Survival information good to have. Supplies Are LIMITED So Please Grab Yours Now!